Dr. James Basilion and his team at the NFCR Center for Molecular Imaging are developing new tools that can literally change the way doctors are looking at cancer. One newly-designed molecular probe allows researchers to view multiple molecular biomarkers simultaneously and see a tumor’s genetic structure in real time. This visualization allows for the very early detection of tiny tumors that will greatly improve treatment outcomes. Additionally, the team developed an imaging technique that may revolutionize cancer surgeries and be particularly helpful with treatments for glioblastoma multiforme (GBM – the most aggressive brain tumor), skin cancers and with breast lumpectomies. This new technology allows surgeons to assess the margins of their surgeries as they are being conducted to see if all cancer cells have been removed. This novel approach could dramatically reduce re-excision rates and reduce or eliminate local tumor recurrence. Center researchers are now adapting their enhanced sensitivity imaging probe for the early detection of liver cancer. The prostate-specific membrane antigen (PMSA) is found in the vasculature of liver tumors and Dr. Basilion is the first to conduct PMSA-based imaging of liver cancer. The PMSA probe, which is used with PET scan, may detect the tiniest of tumors during early liver cancer development. Currently, there are detection limits with current clinical tests and the PMSA probe would fill the gap. Plus, promising preliminary results show that the PMSA probe may also be used to concentrate the radioactivity in a tumor to destroy it, which could offer a potential new treatment for patients with liver cancer. James P. Basilion, Ph.D., studied biochemistry at the University of Pennsylvania in 1984 and attended graduate school at the University of Texas Health Science Center. He then completed his postdoctoral fellowship at the National Institutes of Health and, during this time, he began a series of studies with investigators at the Center for Molecular Imaging Research at Massachusetts General Hospital. In 1996, Dr. Basilion worked at a small genomics and anti-cancer biotech company and, in 1999, he joined the faculty of Harvard Medical School and Massachusetts General Hospital-Center for Molecular Imaging Research. He was later recruited at the Case Western Reserve University Schools of Medicine and Engineering and is currently a professor in both the Departments of Radiology and Biomedical Engineering. 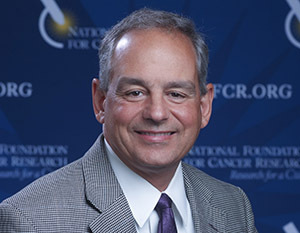 In 2005, Dr. Basilion was tapped to be Director of the NFCR Center for Molecular Imaging. Additionally, he serves as an external advisory board member for the Pacific Ovarian Cancer Research Consortium and Fred Hutchinson Cancer Center, and was a standing member on the MEDI Study Section for the National Institutes of Health. Dr. Basilion has held several offices in the Society for Molecular Imaging (SMI), and was instrumental in the merger to form the World Molecular Imaging Society (WMIS), where he served as treasurer. Dr. Basilion provides reviews for several academic journals and holds editorial board positions for molecular imaging-centric journals. He has also founded Akrotome Imaging, Inc., a company devoted to the translation of molecular imaging technologies. Your ticket for the: James P. Basilion, Ph.D.